Bean Buro’s new office design for Sapientia Investment takes its inspiration from the breath taking vistas observed from the top of the IFC two tower. 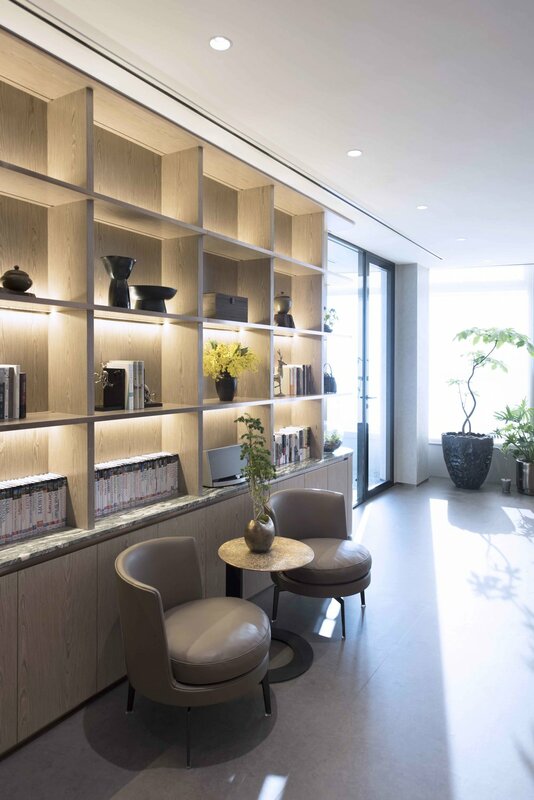 One of the challenges for this project was to create a soothing space, an oasis in the centre of one of the world’s biggest and busiest financial district. As a response to this conundrum, the overall design expresses the natural, organic forms of Hong Kong’s landscape, drawing from the harbour’s energetic movements and topographic form to sculpt a space that echoes its surrounding mountains and tides. This cosy 1,600 sqft office offers an open working area for staff, a boardroom and a private office for the director. A sculptural central bookshelf serves as a linking element to those three spaces, as it wraps around the dividing wall, visible from one room to another through glass partitions. The work area opens to a generous pantry with a large bar. This section of the office was designed with hospitality in mind as it aims to create an area where staff can either socialize or take a break. A continuous bespoke joinery ‘wave’ creates an undulating connection from the open office to the pantry area encouraging staff to fully utilize the space. This architectural expression is also a solution to creating efficient storage, concealing all equipment and paperwork that could otherwise easily pile up and become a distraction. Bean Buro has custom designed a large working table to allocate full-time staff and occasional visiting staff from overseas. This design allows for a flexible and interactive workflow whilst still offering privacy with a half-height acoustic partition dividing the table. As an office space designed for a company established in investment banking, we wanted Sapientia’s new workspace to reflect the company’s status in the financial world. To do so, we have selected finer materials such as Cipollino marble or Italian plaster and have tastefully incorporated them in the space as subtle luxurious accents. Softer colours and materials such as light timber veneer and fabric create a soothing atmosphere to complement this slight note of luxury. 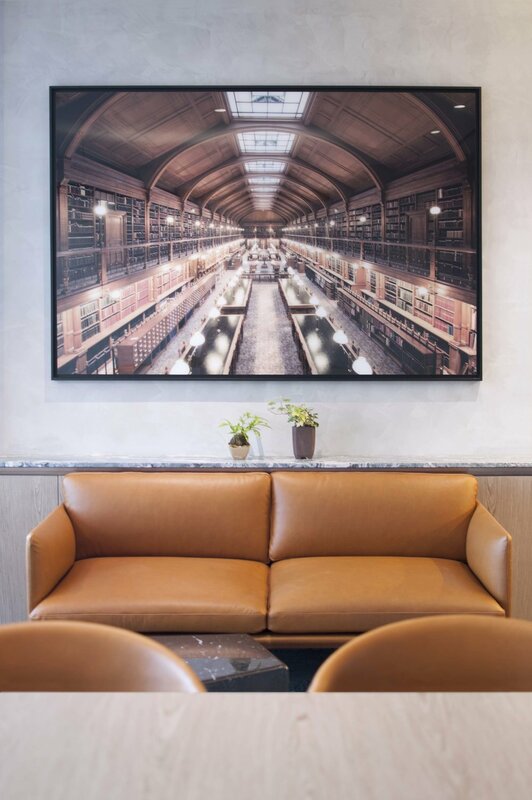 Copper is used to highlight key areas in the office space, such as the niche wall in which the open office table merges as well as the magazine rack that wraps around the bar area. In addition to being a space for formal team and client meetings, the boardroom also serves the purpose of ‘gallery’ area for the office. The room was furnished with iconic pieces of furniture and rare artwork are displayed on the walls and in the bookshelf. Even the TV can easily be mistaken for a painting as the new selected model incorporates the latest technology and design solutions to transform AV equipment into a piece of art.